Correspondence, invoices, and coin lists relating to Kisch’s collecting and research interest in law and the legal profession. Guido Kisch (1889-1985) was a professor of jurisprudence and the history of law and a collector of medals, tokens, and coins relating to law and the legal profession. Guido Kisch papers, 1937-1960, 1973-1981. Archives, American Numismatic Society. Guido Kisch (1889-1985) was a professor of jurisprudence and the history of law and a collector of medals, tokens, and coins relating to law and the legal profession. Born in Prague, he went on to teach the history of medieval law at Leipzig and Königsberg and Halle, but was removed by the Nazis in 1933. He then taught at Prague University and the Jewish Theological Seminary at Breslau before emigrating to the United States where he taught at the Jewish Institute of Religion-Hebrew Union College of New York. In 1962 he moved to Switzerland and was a professor at Basel University. Early in his career, Kisch focused mainly on medieval German law, but after moving to the United States he turned his attention to the history of Jewish-German jurisprudence and to Jewish history generally. In 2007, the American Numismatic Society purchased more than one thousand pieces from his collection of law-related materials, which included medals, tokens, badges, coins, and emblems dating from the 1500s to the mid-1900s. 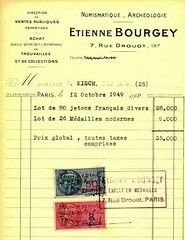 Correspondence, invoices, and coin lists mostly having to do with Kisch’s purchasing of coins, though some materials relate to his publishing and collecting areas of interest, such as war prisoners and Jewish medals (1937-1960). Includes invoices and correspondence from New York City coin dealers such as New Netherlands, Numismatic Fine Arts, Stack’s, Adolph Hess, A. Kosoff, Hans M. F. Schulman, Manhattan Coin, Paul H. Wittlin, and Henry Grunthal, as well as dealers outside of the U.S. such as B.A. Seaby (London) and Etienne Bourgey (Paris). Also present are correspondence with the United States Mint about purchasing a Franklin Delano Roosevelt memorial medal and a Harry S. Truman inaugural medal (1945); a Bureau of the Mint booklet entitled Information Relating to the United States Coins and Medals (1936); and a letter from William S. Dewey, a collector of Admiral George Dewey numismatic materials (1951). Some of the items are written in German, including several German auction catalogs (1957-1958) and nearly all of the later materials (1973-1981), which number fewer than ten items.